Jacqueline Allan, PhD candidate and Associate Lecturer in Psychology, at Birkbeck discusses the little known but extremely dangerous prevalence of eating disorders in Type 1 Diabetics, and her charity Diabetics with Eating Disorders. In 2014 I was lucky enough to be granted a Bloomsbury scholarship to undertake a PhD focussing on Eating Disorders in Type 1 Diabetes, including one known as ‘Diabulimia’, at Birkbeck. I’ve worked in this area since 2009 when I founded the registered charity Diabetics with Eating Disorders. First, let me explain what Type 1 Diabetes is. Type 1 Diabetes is an autoimmune disorder where the insulin-producing beta cells of the pancreas are mistakenly destroyed, making sugar in the body impossible to process. Insulin is one of the most vital hormones in the body – it ferries energy we consume in the form of carbohydrates to our muscles, organs and brain, so it is essential for every bodily function. For this reason, those with Type 1 must check their blood sugar every few hours and administer synthetic insulin to keep themselves safe. 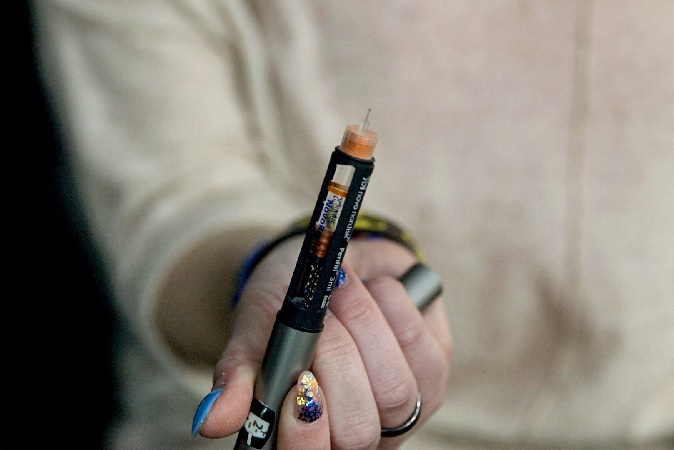 There are two main ways for administering insulin – Multiple Daily Injections using both long acting and short acting insulin, or Subcutaneous Infusion using an insulin pump. Most of us utilise a carbohydrate-counting approach, whereby we know how many insulin units we need for every 10 grams of carbohydrate consumed and what our general background levels should be. If it sounds like a simple equation, it’s not. Everything affects blood sugar – not just the obvious stuff like sports, illness or alcohol but stress, the weather, sleep, menstruation – its educated guesswork. When it goes wrong, we are in immediate danger of death. Too much insulin and we can’t think as there is not enough fuel in the cells of the body. We shake, seize, our bodies have a fight or flight reaction and if not treated with sugar in a timely manner we risk falling into a coma and/or dying. Too little insulin and the body has to find other ways to get rid of sugar and provide energy for itself; sugar escapes into the bloodstream and is excreted in the urine while the body starts burning fat and muscle for fuel. The calories consumed can’t be processed and are not utilised, so the body is forced to cannibalise itself for energy. This process is called Diabetic Ketoacidosis – it is a life-threatening condition and the main symptom is massive weight loss. In this sense, we are borne into a world where everything is about food, injections, the looming threat of complications, hospitals and numbers with the knowledge that ignoring it all results in a substantial reduction in body size. For decades, research has shown that those with Type 1 Diabetes have higher levels of eating disorders that their non-Diabetic counterparts. Anorexia, Bulimia and eating disorders not otherwise specified (EDNOS) are twice as prevalent, and insulin omission is present in around 40% of female patients. The statistics for men are not as clear but levels have been rising steadily since the early 90s. My research looks at risk factors for the development of Eating Disorders in Type 1 Diabetes. I started my PhD in 2014 and found that there is a psychological vulnerability which, when combined with Diabetes-specific distress predicts higher eating disorder symptomology and higher levels of blood sugar. Having modelled these risks, I developed a multidisciplinary intervention delivered online to address them. I am in the process of writing them up at the moment, but initial results are positive. I am also looking at another important question – are we measuring the right thing? One common feature of standard eating disorder questionnaires is that they ask questions which could directly relate to diabetes regimen, rather than eating disorder symptomology – for example, questions like ‘do you avoid specific food groups?’ Many Type 1 Diabetics deliberately avoid carbohydrates in order to control blood sugar as a lifestyle choice rather than an eating disorder. Similarly, many people investigate this population by asking these standard questions that are fundamentally flawed, without acknowledging the issue that insulin omission leads to weight loss. We have made substantial inroads into treating Eating Disorders in Type 1 Diabetes and it has been a privilege to be involved centrally with that research. The National Institute for Health and Care Excellence (NICE) guidelines published earlier this year marked a watershed in recognising the issue, as did the documentary and radio piece with the BBC. There are now two NHS Trust programmes that deal with diabulimia which is more than when I founded the charity in 2009. We still have a long way to go. The next big hurdle is recognising that Eating Disorders in Type 1 Diabetes is fundamentally different due to the nature of the illness itself and that insulin omission and diabulimia are unique. Hopefully, my research will help with that. Category: Science Tags: anorexia, bulimia, diabetes, diabulimia, eating disorders, EDNOS, london, psychology, Science, sugar by Louisa. This is interesting. I work with a patient with type1 diabetes and suffers from poor eating disorders. I wish I could study more about this condition. You are doing a tremendous work.